Plot: In 1945, the Marines attack twelve thousand Japaneses protecting the twenty square kilometers of the sacred Iwo Jima island in a very violent battle. When they reach the Mount Suribachi and six soldiers raise their flag on the top, the picture becomes a symbol in a post Great Depression America. The government brings the three survivors to America to raise funds for war, bringing hope to desolate people, and making the three men heroes of the war. However, the traumatized trio has difficulty dealing with the image built by their superiors, sharing the heroism with their mates. Flags of Our Fathers is a 2006 American war film directed, co-produced and scored by Clint Eastwood and written by William Broyles, Jr. and Paul Haggis. It is based on the book of the same name written by James Bradley and Ron Powers about the Battle of Iwo Jima, the five Marines and one Navy Corpsman who were involved in raising the flag on Iwo Jima, and the aftereffects of that event on their lives. This movie is taken from the American viewpoint of the Battle for Iwo Jima, while the sequel, Letters from Iwo Jima, is from the Japanese viewpoint of the battle, which Eastwood also directed. 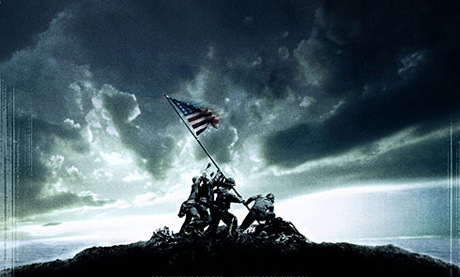 Letters from Iwo Jima was released in Japan on December 9, 2006 and in the United States on December 20, 2006, two months after the release of Flags of Our Fathers on October 20, 2006. The film is produced by Eastwood, Robert Lorenz and Steven Spielberg.